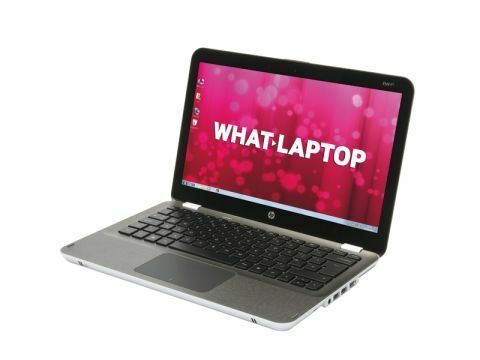 HP's Envy is the company's range topping brand, looking to take on Apple's MacBook Pro, Dell's Adamo and Sony's high-end VAIO models. The Envy 13 is its smallest model in the range and offers an impressive design and powerful graphics. The 13.3-inch screen delivers incredible colour reproduction. It's also very sharp, with more than enough space to multitask. That said, the glossy coating is too reflective to use in direct sunlight. You can switch between the integrated Intel GMA 4500MHD graphics chip and a dedicated ATi Mobility Radeon HD 4330 card, ideally offering the best compromise between power and battery life. Using the ATi graphics card, there's a surprising amount of 3D power on offer for such a small machine, with older games and multimedia tasks dispatched with ease. Battery life is unimpressive, however – lasting for just 152 minutes and severely limiting portability. If you do need all-day usability, you can purchase an additional battery slice for £171, which gives 382 minutes use away from a power point. The keyboard is excellent – each of the keys protrudes through an individual hole in the chassis, as they do on the latest Sony and Apple models, but they feature a longer travel here. As such, it's very comfortable for long periods of use. The touchpad is one of the largest we have seen on a laptop and makes it very easy to navigate the operating system. We're not fans of the integrated mouse buttons though, as they require an overly firm press to register. The quality of this laptop sets it apart from nearly every other Windows-based laptop currently on the market, and it has a lot more in common with Apple's high-end MacBook Pro range than just the curved design. It's very thin – at just 22mm in depth – and the aluminium chassis offers incredible strength for travel use. The inclusion of just two USB ports will put off some users and there's also no built-in optical drive. An external DVD rewriter is included as standard though, which also features two extra USB ports. A memory card lets you easily transfer files between this and other digital devices, and Bluetooth is also built in for wireless connections. 802.11n Wi-Fi lets you join home and office wireless networks and a plug-in adapter also offers an Ethernet port for fixed network connections. With amazing quality and a neat design, there's a lot to like about the Envy 13, but there's no getting away from the high price. The finish and design are eerily similar to Apple's 13-inch MacBook Pro, so the fact that it costs over 50 per cent more is inexcusable.